Bird City teams up with Label Fantastic!’s Wax Mannequin and friends for some March shows! It’s been too long! Bird City (solo) and Wax Mannequin are sharing a bill again! Reunited with traveling pal Martti Mäkkelä These three are playing FOUR shows together in March (joined by one of Jenny’s ALL-TIME-FAVOURITES “Andrew Vincent” for the Ottawa Show!!!!!) 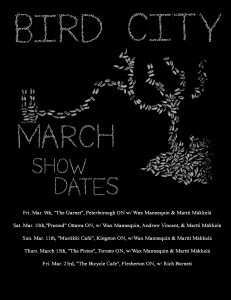 And then towards the end of the month Bird City re-joins her bandmates and shares the stage with the delightful Rich Burnett in Flesherton. Such a month to look forward to. See the dates below!